Not read, but listened to, which still counts for the purposes of the New Year's resolution. I recently upgraded my eMusic account to include audiobooks, and have recently started listening to them while I try to tire the cat out in the mornings so I can get some work done. 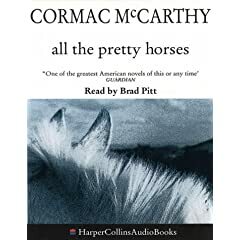 This is an abridged version of All the Pretty Horses, read by Brad Pitt. He's an excellent reader for Cormac McCarthy, because he has that young but weary tone to his voice, which is ideal for telling the story of young men who cross the border from Texas into Mexico looking for work and getting into serious and grim trouble. This story has all the hallmarks of a Cormac McCarthy book (Note: I have never read a Cormac McCarthy book, I'm just going on what people tell me), including horses, trekking across inhospitable landscapes, feelings of loss and loneliness, and extreme and random violence. It's a pretty compelling story, and I'm looking forward to listening to the other two books in the trilogy, which are also available on eMusic for one audiobook credit. Pretty good value, I think. God, this post really reads like one of those fake ones that people are paid to write to big something up, doesn't it?